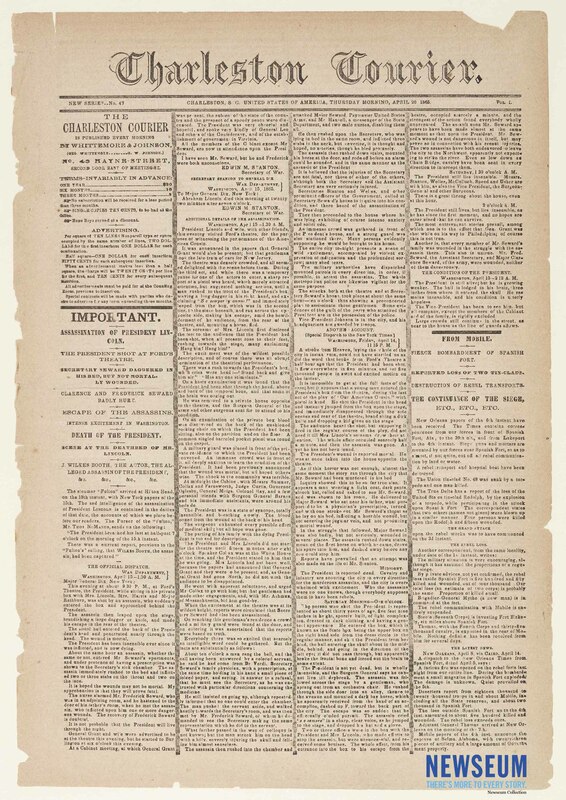 The front page of this Union-occupation newspaper from South Carolina provides details of the assassination of President Abraham Lincoln and the attempted assassination of Secretary William Henry Seward. The Courier received this information via the steamer Fulton which arrived at Hilton Head on April 18, carrying New York newspapers of April 15. Included are dispatches from Secretary of War Edwin M. Stanton to Major General John A. Dix and a special dispatch to the New York Times. Known as "mourning rules," the wide vertical lines between the newspaper columns represent grief over the loss of an important person.